But the Rabbi insisted that it was so, and the abbot went back to his monastery wondering and praying, comforted and excited. Once back in the monastery, he would pass by a monk and wonder if he was the one. Sitting in chapel, praying, he would hear a voice and look intently at a face and wonder, is he the one. The abbot had always been kind, but now began to treat all of his brothers with profound kindness and awe, ever deeper respect, even reverence. Soon everyone noticed. One of the other brothers came to him and asked him what had happened to him. After some coaxing, the abbot told him what the rabbi had said. Soon the other monk was looking at his brothers differently, with deeper respect and wondering. Word spread quickly: the Messiah is one of us. The monastery was suddenly full of life, worship, love and grace. The prayer life was rich and passionate, devoted, […] and services were alive and vibrant. Soon the surrounding villagers came to the services, listening and watching intently, and many joined the community of monks. After their novitiate, when they took their vows, they were told the mystery, the truth that their life was based upon, the source of their strength, the richness of their life together: The Messiah is one of us. The monastery grew and expanded into house after house, and the monks grew in wisdom and grace before each other and in the eyes of God. And they say still, that if you stumble across this place where there is life and hope and kindness and graciousness, that the secret is the same: The Messiah is one of us. When we come into Sanctuary with each other, we bring all of who we are, and all of our experiences. In Sanctuary space, what is most important is that we are surrounded by words of kindness, and people who care about us, and will hold all our feelings. And ideally it is a chance to get away from the unkind words and places of the world. In that spirit, we were invited to write words of kindness about ourselves and others and place those in colorful array in our circle. 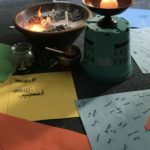 We were also invited to write any unkind words we may have heard about ourselves and others and bring those into the space as well, but in a way that let them go. And so we symbolically burned them. May we continue to be a sanctuary for each other. We were joined in Sunday School by Susan Lush, who traveled to Thailand in February and offered to share some of her experiences in that trip. Most notably, she visited an elephant sanctuary which provided healing services for elephants that had been abused, or injured in some way in their lifetimes. The Sanctuary intentionally spent time making sure that each elephant had places it felt safe, meaningful relationships with other elephants and other human beings, and intentional opportunities for healing. We talked about elephants as deeply social animals, who are very attuned to relationship with each other and the world around them. In that vain, we spent time talking about places in our own lives where we feel safe, places where we feel we have been offered healing, and relationships that have been meaningful to us. 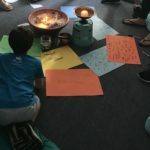 We then engaged in an activity of thinking about ways the world can be cruel, and ways it can be healing and joyful. On the outside of a line drawing of an elephant, we wrote some of the ways that the world is cruel. This was done in monochrome, and surrounded the elephant. Then we took some time to write or draw things very colorfully inside the elephant. These were things that fill us with joy, offer healing, and are ways we appreciate the world, or things we wish there were more of in the world. 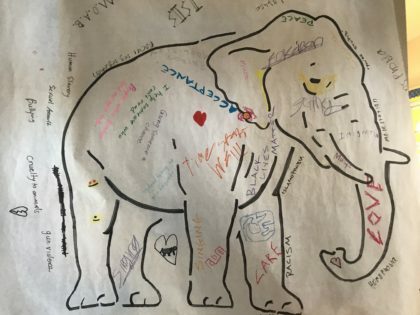 Just as the Elephant Sanctuary that Susan Lush visited sought to draw out what was beautiful and healing in each individual elephant, we recognized the things that are beautiful and healing in each of us, and collectively created a colorful artwork. It will be on display on the RE Bulletin board throughout the week. 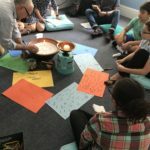 After spending some time with the Parable of the Sower from Christian Scripture, we gathered in Allen Parlor, where several pots of soil were arranged in a circle around the chalice. For our chalice lighting, each person was invited to light the chalice, share something that they wanted to see grow more in the world, and then extinguish the chalice to invite someone else to light it. We then shared our joys and sorrows, but instead of using stones and water, each child was invited to place a seed in a pot for their joy. Since some of the seeds were sunflower seeds, someone suggested eating the sunflower seeds instead of planting them for sorrow. We then spent time planting seeds in pots, as well as spending some time with watercolors while listening to the song “Black as Night” by Nahko and thinking about the “Good things coming” in our individual lives. Our worship concluded by extinguishing the chalice and sharing some things that we have enjoyed watching grow in our lives. We then gathered the plastic on which we had been planting our seeds, which was now covered in soil and loose seeds, and walked outside to scatter the remaining seeds into the church lawn. We will look forward to see if anything grows in the Spring. EXPLORE THE TOPIC TOGETHER. Talk about… We defined magic today as combining focus, intention, and energy. Many other spiritual practices also combine focus, intention, and energy. Tell your child about a spiritual practice you are familiar with and explain how focus, intention, and energy are involved. 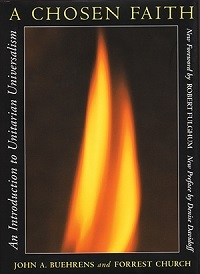 Tell what the practice means to you and how it affirms one or more of our Unitarian Universalist Principles. EXTEND THE TOPIC TOGETHER. Try… Pay extra attention to times when your child creates magic by combining focus, intention, and energy, such as making and carrying out a plan to recycle plastic and care for the Earth or making a get-well card for a relative or friend. Point out instances of your child acting faithfully in a way that reflects the Principle of acceptance of one another and encouragement to spiritual growth. Your child will have the opportunity to tell how they “created magic” the next time Faithful Journeys meets. Pay attention to the evening skies for a few months, including the waxing and waning of the moon. On a clear night when the moon is full, take a family walk, preferably in a natural setting that is familiar to you and safe, with well-marked trails. When you return home, finish the evening with sparkling fruit juice or hot cider, cocoa, or tea or to celebrate the seasonal harvest in your locality or somewhere far away. As a daily practice, say “Thank you” to the Earth for the food, shelter, and very life it gives us. A natural time to do this would be at mealtime, but it also could be a bedtime ritual. Enhance the ritual with prayers or blessings from the book Earth Prayers from Around the World, edited by Elizabeth Roberts and Elias Amidon, or another like it. Learn more paganism through the fictional Aisha in the book Aisha’s Moonlit Walk, by Anika Stafford. The book Circle Round: Raising Children in Goddess Traditions, by Starhawk, is appropriate for parents of any religion who wish to encourage a love of nature in their families. In Sunday’s Session… we used a version of the Prodigal Son story from Christian scripture as a way of focusing on the ways we move away from and back into our homes. The story, “The Lost Son,” helped us illustrate that the love of family is constant whether you are at home or away. The story highlighted the importance of feeling welcomed home, and the importance of welcoming others. In the story, “The Lost Son,” the younger son makes some bad mistakes, but is welcomed home anyway. This story provides a good introduction for talking with your child about how they feel when they break a rule. Are they sad? Embarrassed? Ashamed? How does your child imagine you feel when he/she breaks a rule? Angry? Hurt? Tell your child how you do feel, and that you still love him/her. Talk together about these questions: How do we fix things up when someone has broken a rule or made a bad choice? How do we get over our sad or hurt or angry feelings? In addition to reminding your child that no matter what mistakes they make you will always love them and always welcome them home, you might want to tell a story of some time when you made a bad choice, how you fixed things up afterward, and how you were welcomed home. Everyone getting up from what he/she is doing to greet the returning person. A “sandwich hug” in which a returning person is squeezed between everyone who is already home. Taking a few minutes at the point that everyone returns home to let each person share the best and the worst thing about their day. Hide and seek is a fun way to practice being lost and found, and reminds children that their family will always come looking for them and be happy to see them again. It is also a way that very young children can experience the independence of being “on their own” in a safe environment, secure in the knowledge that they won’t be “lost” for very long. The Runaway Bunny by Margaret Wise Brown (HarperCollins, 1972 ) is a classic story for young children about a young bunny whose mother promises to find him no matter what shape he should take. You may wish to read another version of the parable of the Prodigal Son, and/or a sermon by UU minister Alison Cornish which explores the theme of the Prodigal Son story. Surely they hitched their wagon to a star — and though it fell to Earth, it left a pathway so bright that it still points the way to perfection. We learned about why and how to be a peacemaker by hearing the story of Adin Ballou, an early Universalist minister and founder of the Hopedale Community. We began to put in action our sixth Unitarian Universalist Principle, that we affirm and promote the goal of world community with peace, liberty, and justice for all. We discussed the implications of the phrase “Turn the other cheek,” and how it might be seen as a form of non-violent resistance, rather than a passive acceptance of harmful situations. We also did a small amount of role-play around various scenarios of conflict, seeking non-violent yet active ways to resolve them. Pay extra attention to times when your child is a peacemaker. Point out instances of your child acting faithfully in a way that promotes the goal of world community with peace, liberty, and justice for all. In everyday conflict situations that arise, help your child see the cause-and-effect relationship between making things fair and establishing peace. Identify a peace organization in your area. Find a regular peace vigil to visit or a peace walk to join. Make a family poster for peace and bring it with you. Hold a family meeting once a week and include a discussion of conflicts that arose both within and outside the family. Light a chalice to start your meeting to help set a serious, worshipful atmosphere. Give everyone an equal chance to speak. Celebrate peaceful solutions that occurred, and brainstorm ways to address similar conflicts in the future. Listen to all sides of unresolved conflicts, and work as a family to generate a fair solution. Close the meeting with a song, prayer, or reading and a special, inherently peaceful activity such as playing a game, enjoying a snack or reading out loud together. Today we centered a worship service around the Soul Matters theme of the month: Balance. We shared Joys and Sorrows, but with a framing of “What has nourished you this week? And what has drained you?” Here, we had a recognition that we are not always 100% joyful, or 100% sorrowful, but often hold both those pieces within ourselves. We shared a story of Siddhartha Gautama, who grew to become the Buddha, and who taught a “middle way” towards spiritual enlightenment. As we shared that story, children were invited to write or draw things that nourished or drained them on square pieces of paper. When the story was ended, we folded the papers into small hearts, and hung them on a balanced mobile. We spent some time talking about what has come before us, and what we would like to leave behind. We lifted up the Kingsleys, who put so much energy into the Religious Education program at First Parish Dorchester, and whose legacy lives on. To that end, we also spent time thinking about how to have the RE space provide as much meaningful opportunities as possible for folks who would come in the future. And So: We started doing a clearing out! Over time, a great deal of stuff has made its way to the RE space. Some of it is wonderful and full of possibilities; like a globe that can offer points of reference for stories we tell. Or rain-sticks and chimes that can create beautiful, calming rituals. Or a book that we found title “What is God?” – conveniently the Question(s) of the Week(s)! Other things are wonderful and full of possibilities, but not necessarily for us. And so we have donated those things to Boomerangs Thrift Store. Other things were, to put it bluntly, simply junk that cluttered the space and did not offer much meaning. And so we carefully made decisions to clear said junk out of the space. We are still in a process of cleaning out and making sure that the RE space is full of as much meaning-making, faith-growing resources as possible. Thanks much to Marcia Hubelbank, who volunteered her time and guidance with the kids. And thanks also to the kids, who put such intention into cleaning up the space and opening it up further for future RE sessions. In gratitude for the work the kids put in, each child was invited to choose one item to bring home with them..
We heard a story about Clyde Tombaugh, a Unitarian Universalist who discovered Pluto, and we talked about our fourth Principle, a free and responsible search for truth and meaning. Children learned how our faith affirms us to ask questions; investigate the world; and be open to new information, ideas, and truths. Invite each family member to share about a time you had to let go of a “truth” upon learning new information. Take turns filling in the blanks: “I used to believe ______, but then I learned ______ was true instead.” Discuss how it has, or has not, been easy to accept new truths. Pay extra attention to times when your child asks questions, shows curiosity, or otherwise actively seeks to learn. Point out instances of your child acting faithfully in a way that affirms or promotes a free and responsible search for truth and meaning — their own search, or others’. Choose a topic that interests family members or a question you would like to have answered. Spend an evening in a library or online, learning everything you can about it. Challenge each person to learn at least one new thing (or five, if you are ambitious). The group talked about ancestors – both family and faith ancestors – and the legacies they leave for future generations. The children heard a story, “The Farmer’s Legacy,” in which a farmer coaxes his adult children to continue farming the land he plans to leave them, by telling them as he dies that a treasure is buried in the land. You can find the story on the Tapestry of Faith website. Not all legacies are treasures worth a lot of money. Family traditions that your child knows quite well may contain legacies from your family ancestors. Talk together about the traditions you share as a family. How do you mark birthdays, national holidays, cultural holidays, or religious holidays? Are there traditions peculiar to your family, such as planting window boxes together each spring, or attending an annual reunion of extended cousins? Which of your traditions reflect a legacy from previous generations? Which break with, or modify, your ancestors’ ways? You may want to share with your child the importance of certain family traditions to you. Find out which are important to your child. Katherine Jenkins and Che Djom led our time together on Sunday. Katherine led us in an exercise of brainstorming why it might be important to have difficult conversations in the midst of creating community. Some of the things we came up with was the importance of self-advocacy, the building of honesty and authenticity in relationships, and ensuring that all people were made to feel as safe and welcome as possible. Che shared a story of an encounter he had at a Popeye’s with someone who was being overtly racist to one of the workers, and his not knowing how best to respond to the situation. We then talked about other similar situations in our own lives, and did some role-play around what pushing ourselves to engage in difficult conversations might look like, and how they can more deeply draw us to connect with the many people in our communities. Huge thanks to Che and Katherine for leading Sunday’s session, and helping us think deeply about the importance of difficult conversations and their connection to building community amd social justice. Please continue the dialogue with your youth at home. Consider sharing your own stories about having the courage to have difficult conversations, and how they yielded positive results. Down the street and around seven corners, there was a young couple named Sarah and Rachel, who had just gotten married. They loved each other deeply. But soon after the marriage, Rachel was sorry to discover that Sarah often came home in a foul mood. One thing or another happened during the day that made her grumpy or angry. She carried this burden home with her and was not at all shy about sharing it with Rachel. Who wouldn’t – it was very elegant! “Why not,” said Sarah. “Then I can take your anger into consideration, too. And so they adopted the plan. The very next day, everything seemed to go wrong for Sarah. And as she walked home, her anger grew with each step. By the time she rounded the corner on to the street, she was furious. But when she reached the house, he remembered the plan and what did she do? That’s right! She quickly flipped the tassel around to the front side of her elegant fez. Rachel had been anticipating Sarah’s arrival and was looking out the window. When she saw the tassel, what did she do? She quickly ran to put her apron on! Sarah opened the door, and when she saw the white apron, she thought, “Oh dear. If we both treat each other angrily, that will be terrible!” And so she quickly flipped the tassel back around to the other side of her elegant red fez. She did her very best to take Rachel’s day into consideration, and treat her with kindness and compassion. Rachel, knowing that Sarah had also had a hard day, also was quite kind. They had a lovely evening. A few days later, the same thing happened. Sarah was angry but caught herself in time before she got home and what did she do? Of course, she flipped the tassel around. And Rachel – as soon as she saw Sarah’s fez, she put her apron on. When Sarah saw the apron, she rearranged her tassel and they we both very kind to each other once again. The same scenario, with the tassel and then the apron and then the tassel, happened over and over again, several more times. Finally, Sarah said, “It is very strange: every time I come home angry, you are angry too. “It is strange indeed,” replied Rachel. “But it is good that we are able to treat each other with kindness even when we are in a bad mood.” And then she added, “We human beings have been cursed with tempers, but we are also blessed with wisdom. Perhaps we could both agree to not take our anger out on each other when we are in bad moods, and instead decide to always be kind and compassionate to one another. “That would be wise,” said Sarah. At every Sunday School session, we take a moment to share our joys and concerns of the week. It is a moment of connection and community building that helps us celebrate with each other when there are things to be celebrated, and helps us lift each other up through our challenges. The last time we were in worship, several folks expressed an interest in expanding this moment. So for our worship today, we intentionally took time to share our joys and sorrows. 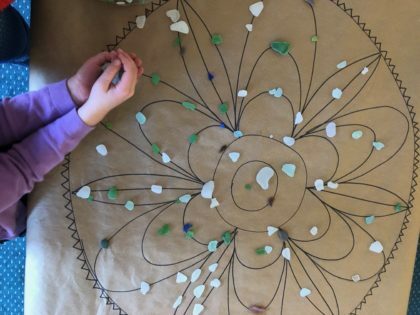 A simple mandala design was laid out, and all were invited to take a piece of sea glass and place it intentionally on the mandala while sharing their sorrow or joy. Personal concerns, concerns about the city, concerns about the country, concerns about the world. Followed by personal joys, joys about the city, joys about the country, and joys for the world. 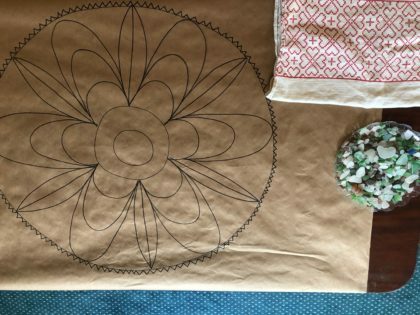 We all listened attentively as each person shared the pieces that were going on in their lives, and as the mandala design filled up. In closing, we sang “When Our Heart is in a Holy Place.” It was indeed a sacred and intentional time of deep sharing.